For the 1988 TV series, see Superboy (TV series). In 1985, Warner Home Video released eight selected episodes of the series on VHS in the "Super Powers" video collection along with Aquaman, Batman, and Superman. These videos were rereleased in 1996 and are out of print. Although The New Adventures of Superman has been released on DVD, the sets do not include the Superboy shorts because of a battle between Warner Bros. and the estate of Jerry Siegel over the rights to the "Superboy" name that occurred at the time. The series remains unreleased to DVD. 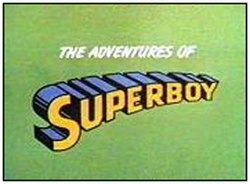 The series premiered on September 10, 1966 as part of a 30-minute program named The New Adventures of Superman, featuring two Superman shorts with one Superboy segment in between. "The Spy From Outer Space Part 1" - Krypto encounters an alien spy who creates disasters on Earth as part of an invasion attempt. "The Spy From Outer Space Part 2" - Superboy must be rescued by Krypto when he follows the spy to his home planet and the system's red sun drains his powers. "Krypto's Calamitous Capers" - A criminal scientist has created a sonic beam transmitter with which he can cause Krypto to turn belligerent. "The Man Who Knew Superboy's Secret" * - A man pretending to be from Krypton sets a trap for Superboy by promising the ability to inject immunity from Kryptonite. "The Deep Sea Dragon" - A dragon whose egg is mistakenly taken by deep sea divers becomes violent until Superboy sets things right - but the egg is later stolen by undersea pirates. "The Super Clown of Smallville" - A sickly billionaire vows to give away his fortune to charity if he can be made to laugh. "The Visitor from the Earth's Core" - When Superboy drills to the Earth's core, he finds a glowing black sphere that draws out a crystalloid being. "The Beast that went Berzerk" - A scientist's growth serum makes a pygmy elephant into a giant beast; the scientist developed an antidote, but his bitterly jealous assistant sabotages the experiment. "Superboy's Strangest Foe" - Two alien children cause havoc on Earth through their innocent play. "The Capricious Crony" - An undersea volcano releases an impish water being who causes havoc on solid ground. "Krypto, Super Seeing-Eye Dog" - When a Kryptonian space probe is found, it contains weapons, one of which accidentally blinds Superboy. "The Black Knight" - Clark Kent's young friend Timmy (Lou Scheimer) finds a magician's mantle that transports him back in time to the jousting fields of Camelot and King Arthur. "Operation Counter Invasion" - Superboy must convince three alien warriors that Earth is populated by metahumans. "The Jinxed Circus" - Superboy must help a circus being sabotaged by the ringmaster's former partner. "Hurricane Fighters" - Superboy must work to stop a violent hurricane. "Superboy's Super-Dilemma" - A scientist tests a Kryptonite antidote on Superboy that does not work, but which he accidentally mixed with plant growth serum that causes big problems. "A Devil of a Time" * - Spotting two criminals during a costume ball, Clark Kent decides to use his devil costume to masquerade as the real Mephistopheles. "The Revolt of Robotville" - Robotville is an experimental city controlled by machine beings, which suddenly go on a rampage at the programming of the city's evil main engineer. - Asterisk indicates episodes that do not contain narration. The Superman/Aquaman Hour of Adventure was first broadcast on September 9, 1967. This 60-minute program included new Superboy and Superman segments, and adventures featuring Aquaman and his sidekick Aqualad. It also comprised a rotating series of 'guest star' cartoons featuring the Atom, the Flash and Kid Flash, Green Lantern, Hawkman and the Teen Titans (Speedy, Kid Flash, Wonder Girl and Aqualad). "The Beast With Two Faces" - A saurian beast rampages through a Central American village before suddenly going docile, and the reason why is exploited by a gang of thieves. "The Gorilla Gang" - During a school exploration of a canyon, Clark Kent and Lana Lang are captured by fugitive gangster "Ape" Hanson and his mob. "The Chameleon Creature" - In the jungles of Africa, a mysterious mist transmutes an albino creature into any form. "The Great Space Race" - Superboy must help a crew of interplanetary authorities (modeled after actor Barry Morse) pursue an evil scientist whose weaponry is causing disasters on Earth. "Finger of Doom" - A scientist is irradiated by the energy of a rogue star, turning him into an evil being with super energy emanating from his hands. "Krypto, K-9 Detective" - Dog thieves are on the rampage until Krypto, posing as an innocent dog, is captured. "The Neanderthal Caveman Caper" - Four fugitives encounter an iceberg in which a caveman has been frozen in suspension and now is revived. "The Terrible Trio" * - Three school bullies are taught a needed lesson from Superboy. The Batman/Superman Hour premiered on September 14, 1968, featuring Superboy and Superman shorts alongside the adventures of Batman, Robin and Batgirl. "Forget Me Not, Superdog" - Breaking up a meteor shower, Superboy and Krypto are struck by a kryptonite meteor, which gives Krypto amnesia. "Superboy Meets Mighty Lad" - An alien youth has created superpowers implanted in a blue costume and begins showing off on Earth. "King Superboy" - After destroying a fireball that bombards Earth, Superboy is hailed as a king by an alien civilization whose populace is held hostage by the Chrystal people, the source of the fireball. "Double Trouble, Double Doom" - Space authorities recruit Superboy to help them track down a gang of pirates. "The Trap of the Super Spacemen" - Alien beings capture astronauts and drain their energy into their warriors, and proceed to do the same to Superboy. "The Space Refugees" - Three vicious prospectors attack a pair of aliens who seek only sanctuary in a mountain countryside. "The Monster Molecule" - A Universal Molecule is used in an experiment that goes wrong; a scientist is irradiated and Superboy must fly 1,000 years into the future, where the Molecule will have grown to large size. "The Great Kryptonite Caper" - A gang hopes to use a Kryptonite amulet against Superboy, but in trying to lure him into their trap they accidentally detonate an underground oilfield - which causes them to lose the amulet, which is later found by Lana Lang. This page was last edited on 19 March 2019, at 04:03 (UTC).